I’ve pondered long and hard over what I’d do differently for my next bike. Alot of that contemplating was done whilst on the saddle of my current ride, a ‘Surly Long Haul Trucker’. I love the ‘Trucker’ it’s proved to be everything it’s renowned for. It’s a solid, comfortable touring bike that I trust whole-heartedly but I now need a different steed for a different type of touring. I love getting off-road and my ‘Surly LHT’ with it’s 700c’s just isn’t up to the job. Whilst riding my ‘Long Haul Trucker’ I’d often think I should have chosen the 26 inch wheel frameset, back then most of my riding was on-road rather than off of the beaten track. I’ve got to say I enjoy road riding less and less these days. There’s some lovely country roads in the UK, especially in my neck of the woods around Hampshires South Downs. These quiet lanes are nice to ride but being completely free from traffic is definitely my preference. My touring is nearly always combined with wild camping. Towards the end of a days road riding I’d start to think about my camping spot for the night. It goes without saying that the ideal camp ground is never next a road! I end up pushing, carrying and generally wrestling my loaded bike off-road for my nights rest. I’m hoping this new build will let me plan entirely off road adventures where I’ll be able to camp on or just off the traffic-free route I’m travelling. 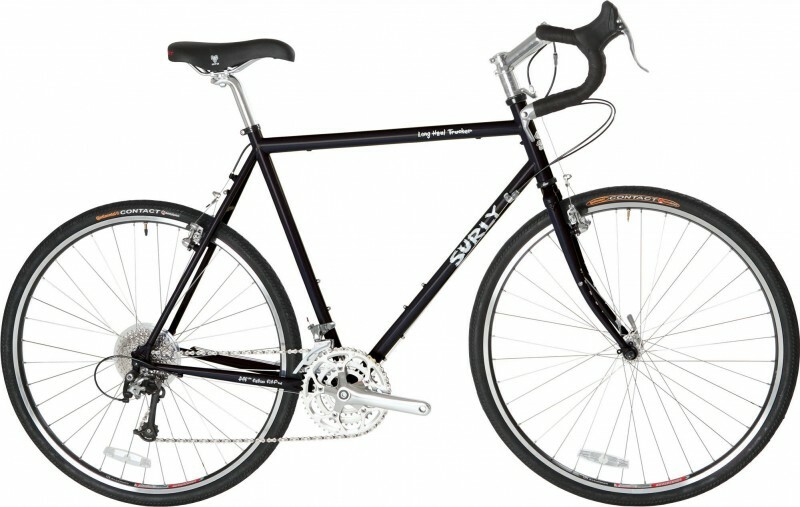 Surly Long Haul Trucker 26″ ? I love the ride from my 700c LHT so its smaller-wheeled sibling was an obvious consideration for my off-road adventures. I had decided on disc brakes for this next bike, I checked out a ’26” Disc Trucker’. I know a lot of cycle tourists consider this a ‘go anywhere’ tourer but I can’t help seeing it as a road frame with mountain bike wheels. Even the better proportioned 700c frameset has a ‘farm-gate’ look about it. The 26 inch frameset dare I say it …. just looks wrong, especially the larger size frames. 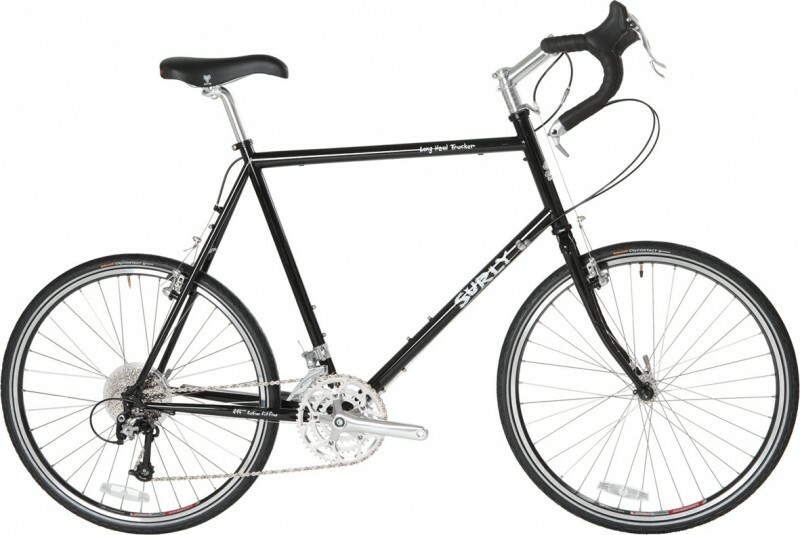 With it’s long head, straight top tube and stretched chain stays, the ‘Trucker’ is an out and out road touring bike in my eyes. Obviously 26 inch wheels are more readily available worldwide than 700’s and for this reason alone the ‘LHT’ in this size has it’s place. It’s also perfect if you want traditional touring bike dimensions but plan to ride gravel trails or badly surfaced roads. However, if you are used to the roll of 700’s you’ll notice that you’re working harder with 26″ rims on the road. I intend on touring far and wide on this bike, shipping a full size tourer can be a nightmare. 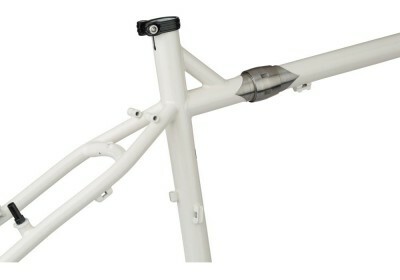 The ‘S&S Coupler’ is an ingenious bit of engineering that allows a bike frame to literally be split in half for travel. Anyone that has flown with their bike will know the headache that comes with it. 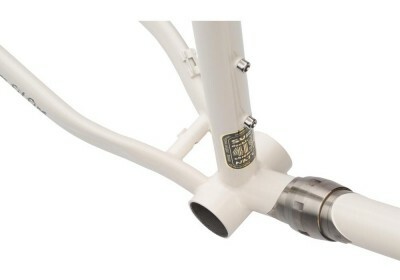 S&S Couplers allow your bike to fit into a 26″ x 26″ x 10″ case that travels as regular airline luggage. Some frame-builders manufacture full size tandems that will fit complete, including the wheels, in the same case! An ‘S&S coupler’ is also known as a ‘Bicycle Torque Coupling’ or ‘BTC’. They can be built into a frame during its manufacture or retrofit into an existing frame. A BTC system can be added to most steel, titanium and even carbon frames (triangulated frames with round tubes, not monotube frames). In a standard installation two couplers are required, usually cut in to the top and down tubes. Both couplers add only 8 ounces but are stiffer and stronger than Reynolds 531 tubing. The coupler has precision machined teeth which lock together when tightened. There’s zero clearance for a ride that doesn’t differ to a standard frame without a coupler. Take a look at the S&S website it’s a wealth of information. Surly Troll or Surly World Troller ? Surly’s ‘Troll’ looks ideal for my needs. The ‘Surly World Troller’ even more so. The ‘Troller’ is the ‘Surly Troll’ with ”S&S’ Couplers’ cut in to it at the point of build. There’s a dedicated area for anchoring a Rohloff hub OEM2 axle plate, and we’ve included threaded M10 x 1mm holes for installing Surly trailer-mounting nuts or B.O.B. Nutz. 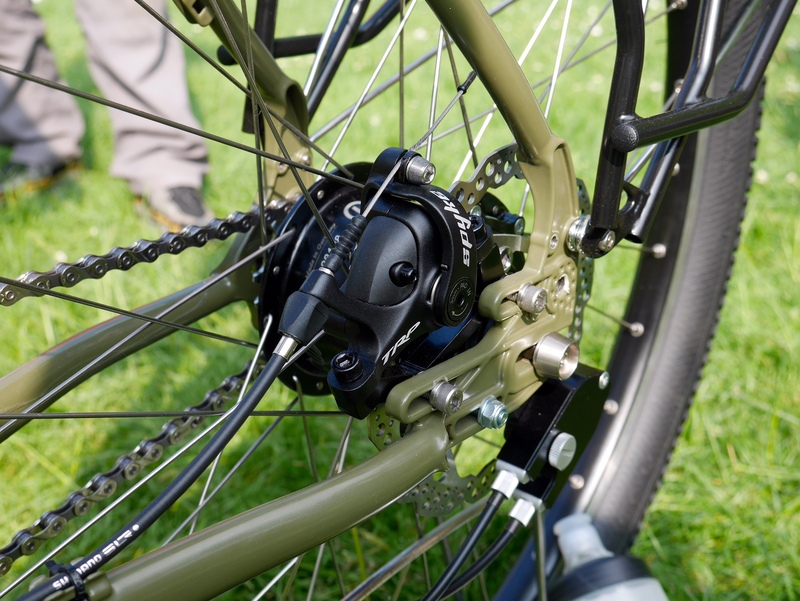 The dropout design allows the simultaneous use of a rack, fender and disc brake. We include canti pivots, too. Options, options, options. The ‘Surly Troll’ is available in a range of colours and you can even opt for a frame prepared ready for paint, then choose your own bespoke colour and finish. Unfortunately the ‘Surly World Troller’ is currently only available in an off-white colour which isn’t great when you’re trying to blend into your surroundings whilst wild camping. My bike builder of choice is Ghyllside Cycles, they’ve a great reputation amongst the cycle touring community. I was so impressed with their knowledge and enthusiasm when chatting with them at the Cycle Touring Festival in May last year. There’s some distance between us, I’m on the South coast and Ghyllside Cycles are in the Lake District. The plan is for Kevin, Calvin (owners) and I to keep talking between now and the next Cycle Touring Festival (27-30th May 2016) when I’ll hopefully have a complete shiny new bike to collect! During one of our calls, I mentioned that I wasn’t keen on the colour of the ‘World Troller’. Kevin also being a keen wild camper came up with the perfect solution. He would arrange aftermarket fitting of the S&S Couplers to a regular ‘Surly Troll’, this would allow me a custom paint choice. 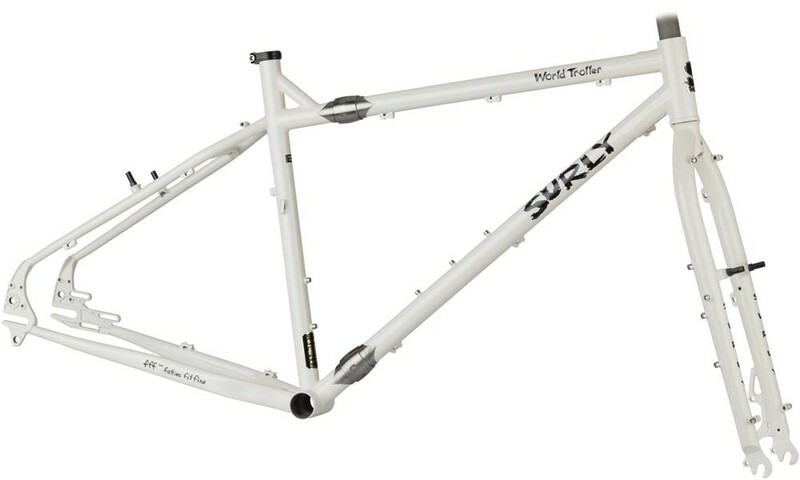 An official ‘World Troller’ frame (off-white) from Surly will set you back *£999 or you can buy a ‘Surly Troll’ frame for around *£450 and then have the S&S Couplers fitted as well as a custom paint job for another *£625. That’s an additional £75 well spent for years of discreet wild camping and ownership of a one-off ‘Troll’. I’ve been considering this frame myself, but I don’t know how the gear and brake cable separators will go unless there are some I don’t know about that can accommodate the cable outers. Where will the cables be split on your build? 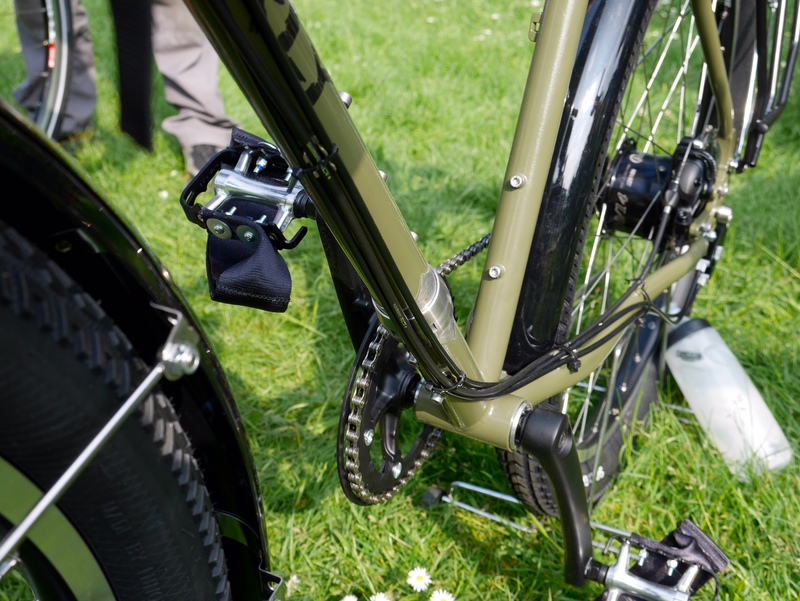 Hi Mike, the cables won’t have separators, they’re cable tied to the eyelets so to split the bike the cable needn’t be disconnected just unclipped from the frame. I’ll upload some pics when I can. To split the couplers, the rohloff external box is unscrewed (1 screw) and back brake (2 screws). The cable released (cable ties) and left attached elsewhere. Hope that explains it …. badly?